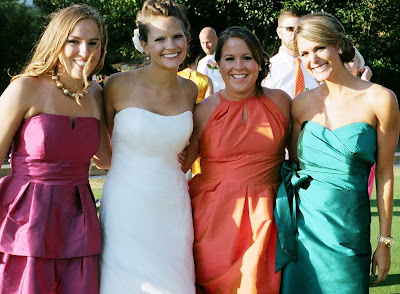 If you've watched the movie "27 Dresses", you know the longstanding joke that brides always think they've picked a dress that their bridesmaids can wear again, which never really happens. Okay, maybe it does happen sometimes (the three bridesmaid dresses hanging in my closet untouched would beg to differ). But what if you were allowed to pick your own dress style, or even pick your own style AND color? While the bride's executive decision should never change, it helps that her choices are expanding, therefore giving her bridesmaids more choices too. Designers are taking into account body type and style preferences while still maintaining a consistent overall look. Dessy Group creates "sets" of dresses, where 3 or 4 styles clearly belong in the same design family, such as doing a strapless, a v-neck, and a halter version. And the whole Alfred Sung line is meant to be mixed and matched, which has been incredibly popular with our brides. Of course there's nothing better than to show you what we're talking about! Laura posted a facebook fan photo of her and her bridal party dressed in shades of gray with adorable raspberry shoes. Her mom, to her right, was the matron of honor. How sweet is that? And maid of honor Remy sent us a photo from her childhood best friend Lea's wedding. The girls wore a variety of Alfred Sung dresses in different styles and colors. The wedding was at Skytop Lodge on a gorgeous August day in the Pocono mountains. What a great idea to to have such vibrant color dresses set in the backdrop of an outdoor summer wedding. We never get tired of getting photos from our customers and knowing that we were able to play a small part in someone's very special day, so keep them coming!